Do you have any suggestions for someone like myself that is allergic to bananas? I know, how odd right? But they make me throw up like mad! Also, I love your new blog and follow it! I wish my sis-in-law and I had as much in common but alas, we are VERY different. I have used avocado in mine before which would give it the creamy consistancy that a banana provides. Apples (peeled) make a very frothy smoothie as well. Other than that, just pick your favorite fruits and don't forget the greens! Thanks so much and I am glad your reading!! Thanks. I"ll have to try other fruits because I'm allergic to avocado also! Oh bummer! Any fruits that you like and are not allergic to will work fine. Try the apple, it gives it some texture. No matter what you use, it will be a refreshing, filling and super healthy snack! Hey Daedra! It's so good to see you on here! I sometimes delete the banana part altogether if I'm out and it doesn't really ruin the smoothie. I like to add frozen blueberries or cherries (from our coop):) instead of the ice when I'm out of bananas and I still get a nice thick creamy smoothie! I've linked your blog on mine so that I can keep up with what you're posting about because it's so great! I love your blog and all the pictures of your family. 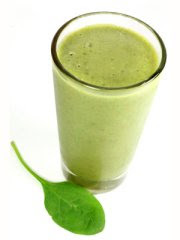 green leafy vegetables are great sources of antioxidant and this is a really cool and healthy smoothies! i would love to try this one out. i also love minty taste in my smoothies, makes a perfect summer chillos! the picture make me remember about one of my favorite drink namely green tea smoothie. It is very important to include a lot of vegetables and fruits in your food. I like salads that include both fruits and vegetables.